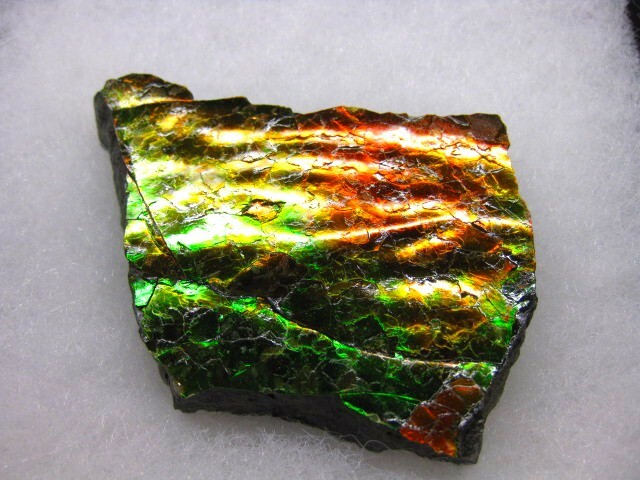 This is a section of a Gem Ammolite Ammonite. 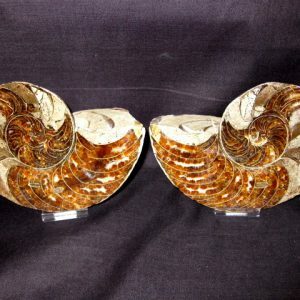 These specimens are obtained when the ammonites are damaged during mining and cannot be repaired. 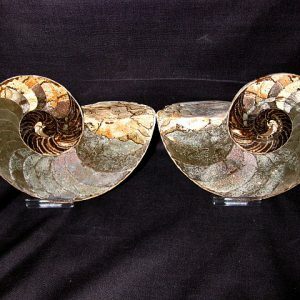 The sections of broken ammonite have their Gem Ammolite layer cleaned and hand polished then a thin coat of archival grade lacquer is applied to protect the gem layer. This specimen measures approx. 2 5/8″ wide. 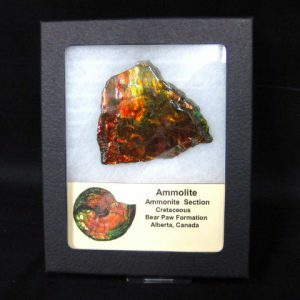 The natural stone Ammolite consists of brilliant, intensely hued bits of a rare, mineralized fossil shell. 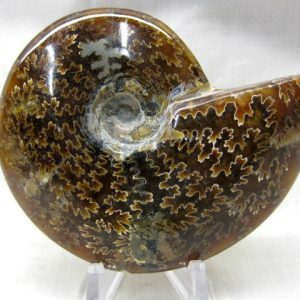 The mollusk ammonite became extinct more than 70 million years ago. 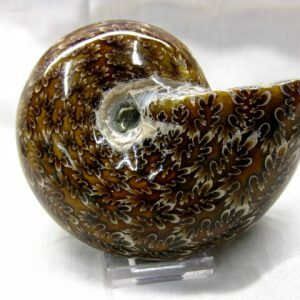 When the fossil ammonite becomes opalized it is called Ammolite. 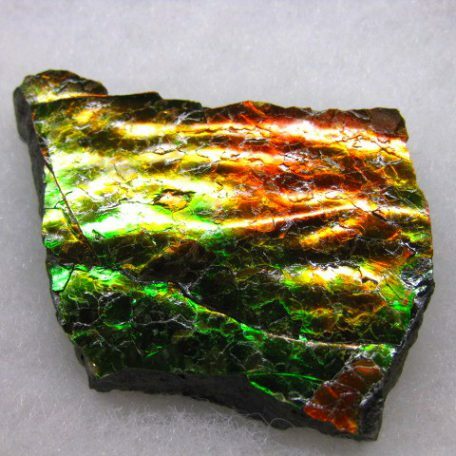 Rare, gem -quality ammolite appears similar to black opal, showing different color combinations when the stone is viewed from different angles. The most common colors range from yellows, oranges to reds and greens. The blues are more rare and hence more expensive. The blue is a deep brilliant blue changing to turquoise. Absolutely stunning! 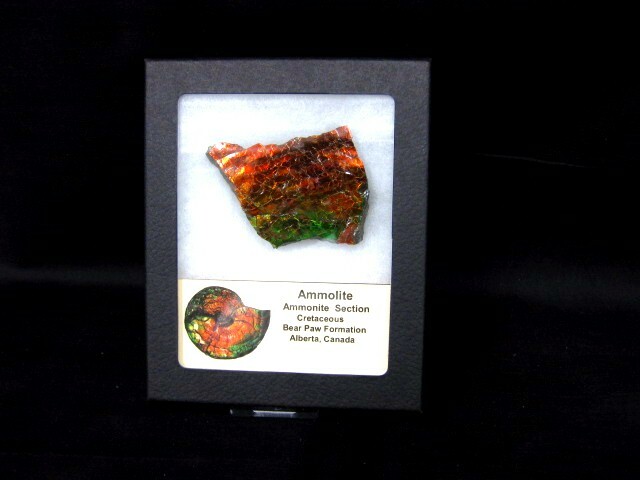 Ammolite is found only in southern Alberta, Canada. 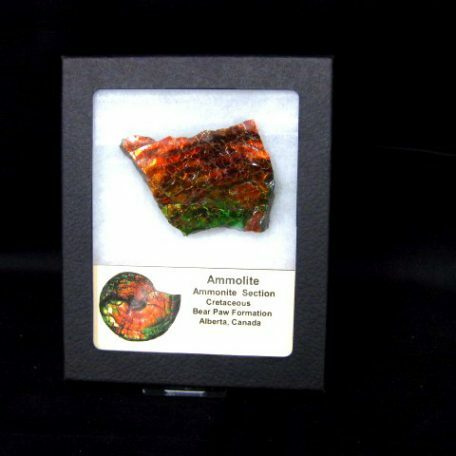 The story of Ammolite begins over 65 million years ago during the Cretaceous period when dinosaurs ruled the earth, pterosaurs glided overhead in the skies, and the oceans teamed with an enormous variety of aquatic life. Accompanied by tropical climates, the continents were evolving into the shapes and global positions we are familiar with today. During this time the interior of North America was partially submerged under the warm shallow Bearpaw Sea which bordered the developing Rocky Mountains. Today part of this region is south eastern Alberta, Canada. Living in the Bearpaw Sea were many exotic creatures like plesiosaurs which “flew” through the water like penguins as they diligently fished the shallow waters. In addition to such “monsters” were ancestors of modern sea life such as sharks and turtles. One such ancestor were the ammonites, the predecessor to squids and the south Pacific nautilus. 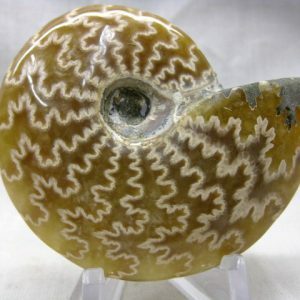 Ammonites were squid-like creatures with coiled shells containing gas filled chambers which provided buoyancy. Like modern squids and nautiluses, they propelled themselves through the water with a “jet” and when threatened, clouded the water with ink during their escapes. Ammonites needed such speed and defense as they were favored as a delicacy by mosasaurs, another predacious marine reptile. Sinking it’s peg-like teeth into the coiled shell, a ravenous mosasaur would extract the ammonites squid-shaped body and devour it, discarding the empty shell which then sank to the sea floor. This is where fortunate circumstances came together to create specific conditions for the next step in the birth of a gemstone. 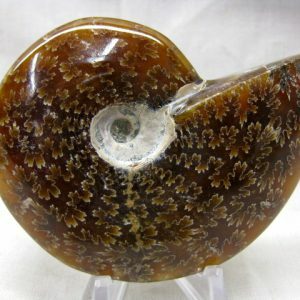 Settling on the sea bottom, the empty ammonite shell was buried in mineral-rich sediment carried there by rivers and streams from the young Rocky Mountains. 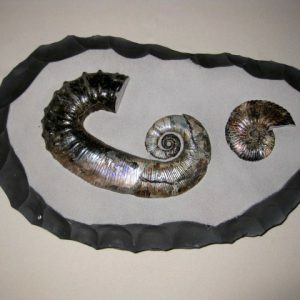 During the fossilization process the sediment not only preserved the shell but also enhanced the shell’s colors into iridescent greens, reds, yellows, and rare blues and violets. 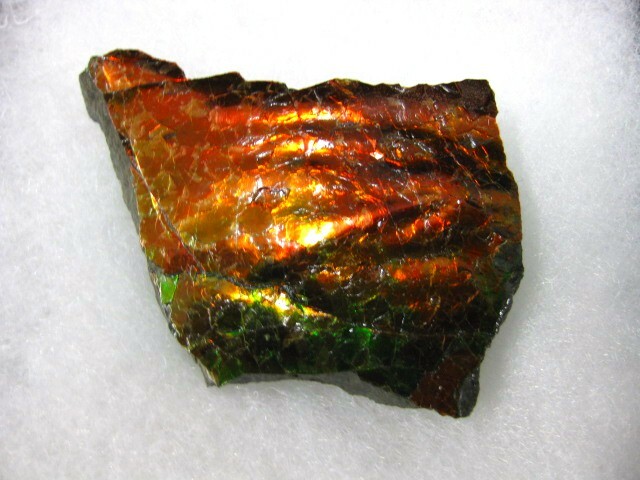 In 1981, the International Colored Gemstone Commission (ICGC) recognized this new organic gemstone as Ammolite. 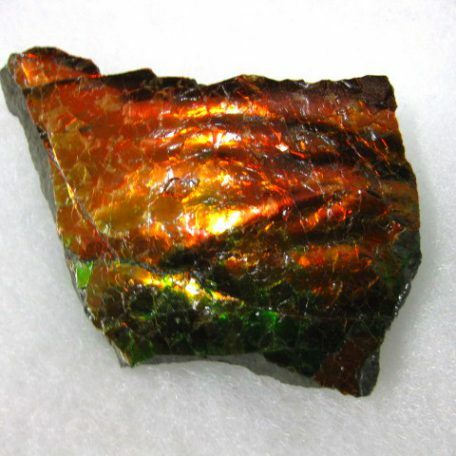 With a finite supply in a very specific area and only one in a hundred of the preserved shells yielding few gemstones, Ammolite is arguably the rarest gemstone in the world!